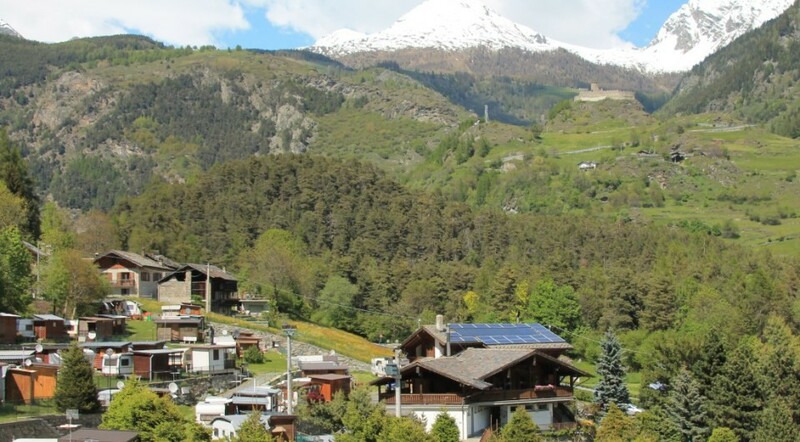 “La Grolla” Camping Village is located in Torretta hamlet (Challand-Saint Anselme, AO), only 12 km far from the Verrès toll booth and at a short distance from Brusson and Champoluc, immersed in the green Valle d’Ayas at an altitude of 1200 metres. Take the A5 highway towards Aosta (Verrès exit), then take Strada Regionale 45 to Brusson and reach Challand-Saint Anselme. The camping is 2 km farther than Challand Saint-Anselme. We are at Challand Saint Alselme (AO) in the middle of the beautiful Val D’Ayas in Valle d’Aosta, with a view on the Castello of Graines and in a strategic position to reach the main touristic, naturalistic and sport attractions. We are open the whole year through, the camping is located at an altitude of 1200 metres, in an area of 15.000 m2. It is the ideal place to spend summer and winter holidays immersed in a wild nature. A traditional environmentally sustainable building, made of brick and wood, offers to our guests a panoramic lounge bar perfect for musical and cultural events or just for spending the night in a friendly atmosphere all gathered around the big fireplace. There is a large play ground for our younger guests and an outside zone suitable for many sports (football, volleyball, ping pong, archery). camping: for the open-air lovers, caravan and tent spaces that are usually really appreciated by permanent and travelling settlers. Caravan rent service: for those who have no private mean of transport but wishes to experience this open-air tourism. Flat rent service: for a higher comfort but without renouncing an authentic mountain vacation. In winter, you will find some cross-country skiing slopes at just 300 metres from our Camping (in the large district of Brusson) and some alpine skiing slopes at a short distance (districts of Estoul-Palasinaz, Col de Joux, Monterosa Ski district –Champoluc, Frachey, Antagnod). In summer, you can take advantage from the tranquillity and the relaxing surroundings by walking, hiking and cycling through the paths (we also work as a bike camping, please read our special bike). Our camping is located on the Ru D’Arlaz path (an itinerary of 11 km of woods, villages and pastures that have wonderful views on the valley of the noble family of Challant) next to the gold mines where there is the most beautiful crystallized gold in Europe. To learn more about our family story since 1985 please read the “Chi Siamo” page of our website.